Many bull tamers were injured in the events, police said. Chennai: A 45-year-old man in the spectators’ gallery died of heart attack, while over 40 bull tamers were injured in the Jallikattu sport in Alanganallur on Thursday. The event was inaugurated by Tamil Nadu minister RP Udhayakumar by the release of a bull from its pen. 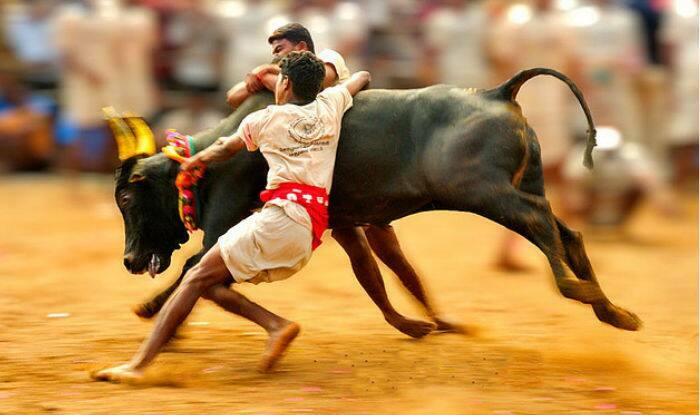 The bull-taming sport was conducted across Tamil Nadu. It is a part of the Pongal festival that began on January 15. Foreign tourists also attended the Jallikattu event in which a total of 729 bulls was used. For the first time, the Indo-Tibetan Border Police team was deployed at the site in addition to the 1,500 police personnel. Udhayakumar, who unveiled the memorial slab for Jallikattu at Alanganallur, said that a memorial would soon be built to honour the pro-Jallikattu protests. Gifts worth lakhs of rupees including motorcycle (Best Tamer) and a car (Best Bull) was granted to the successful bull-tamers as well to those whose bulls could not be tamed. Usually, temple bulls are first sent through the ‘Vaadi Vasal,” the entrance to the sporting arena as part of prayers for a good harvest and prosperity. These bulls are not caught by the tamers, in respect of the tradition. Earlier on Wednesday, Jallikattu was held at Palamedu (Madurai) and Periya Suriyoor (Tiruchirappalli). On Tuesday, it was held at Avaniapuram (Madurai), coinciding with the Pongal festival. Over 800 bull tamers and more than 700 bulls participated in the event. The sport left about 100 youths and some spectators injured, police said. The festival was banned by the Supreme Court in 2014 after complaints of extreme animal cruelty. However, Tamil Nadu enacted a law in 2017 to bypass the top court’s verdict, owing to massive protests challenging the ban of the event. During that year, in the third week of January and the first week of February, Jallikattu was held in certain places.